A new grip adds horsepower to the J frame. The Redi-Load grip is a comfortable, snag-free unit that holds four rounds for quick reloads. We gun writers love writing about the latest high-cap pistol or tricked out 1911. After all, they're fun to shoot, cool as the other side of the pillow and ideally suited for ending a gunfight in decisive fashion. But the fact is carrying those big semiautomatics day in and day out can be a real pain. I usually carry a full-size pistol, but there are times when only a pocket gun will do. If I'm just heading out for a loaf of bread or for a run, I always grab a J frame. My favorite is Smith & Wesson's Model 642, a hammerless .38 Special. J frames are great because they are snag free, concealable and weigh next to nothing. And when loaded with high-performance hollowpoints, they're plenty powerful. But some folks shun J frames because of their five-shot capacity. I'm not one of them, but I wouldn't complain a bit if I could pack a little more firepower. Enter the Redi-Load from ARES Defense Systems. At first glance, the Redi-Load looks like nothing more than a set of black aluminum grips. But a hinged floorplate on the bottom of the grips conceals four extra rounds of .38 Special ammunition right on the gun. If a trip to the store turns loud unexpectedly, those four extra rounds could be a lifesaver. I admit I was a bit skeptical when the Redi-Load grips showed up on my doorstep. But once I finally got them on my gun (I had to hold my lip just right and utter the right combination of four-letter words to get the precisely machined grips on the gun), it didn't take long for me to become a fan. The Redi-Load makes sense to me because, in my experience, so few people carry spare ammo for their revolvers. When I ask my wheelgun-packing friends why, they say they don't need them because they either aren't expecting to really need their gun or because revolvers are so reliable they don't feel the need to carry spare ammo. I can't agree with either line of reasoning, but as someone who carries a revolver a great deal, I must say that speedloaders are a pain to conceal. Speed strips make sense, but it's one more thing to carry. The Redi-Load shines because you don't have to carry anything else; it keeps four spare rounds right on the gun. The Redi-Load is also a damn comfortable set of grips. They are a bit thin front to back, but the contour required for the grip to hold those extra rounds fills my hand well. The shape of the grip also keeps my hand nice and high on the gun, which makes it easy to control in rapid-fire strings. Give isn't one of aluminum's strong suits, so don't count on any recoil reduction from these grips, but they don't accentuate recoil too badly, either. 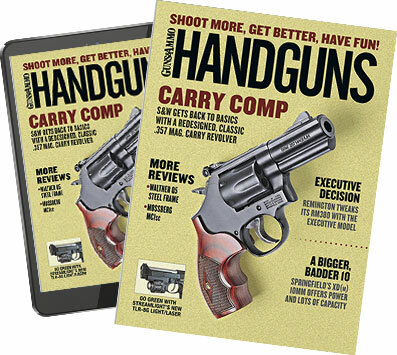 The smooth finish might cause the gun to slip in your hand in wet conditions, but the grip's circumference is small enough that you can get your hand around it enough to keep the revolver from shifting. I didn't have any trouble with it shifting in my small hands during my range session, which included 10 cylinders of rapid-fire work with full-power loads and 10 cylinders of wadcutters. The smooth grip made my Redi-Load-equipped 642 easy to slide in and out of my pocket. The texture of the grip didn't catch on my pants when I wore it in my ankle holster, but it did stick out a tiny bit more than the Spegal boot grips and the Crimson Trace laser grips my J-Frames usually wear. It might cause a problem with tight jeans, but it didn't hang up on my pants. On the range, the floorplate release worked smoothly and positively, and the rounds slid right out of the grip as soon as I opened the floorplate. I had to get used to all four rounds falling out at once, but they fell into my hand naturally. The downside was managing all four rounds without dropping any. After a bit of experimenting, I found it best to empty the cylinder, then drop the new rounds into my hand and start loading. I invariably dry-fired one time as I worked my way through the second cylinder, but it didn't take many repetitions before I was my reloading much quicker and smoother than I would have guessed. Overall, I really dig the new Redi-Load grips. The only negative I could come up with is they make me choose between my Crimson Trace laser grip and having four spare rounds on the gun. A new grip that combines a laser and four rounds would elevate the pedestrian J frame to a whole new level.